Landscape Construction Materials	There are	11 products. Collect for. £78.00 m2 inc. 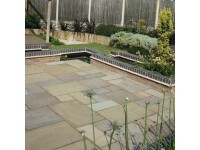 In this section we look at the basic hard landscape requirements. The patio, edgings, circles, the general building of the garden. Stone walling, height changes with steps and rockeries, all the material to form the basic feel of the garden. 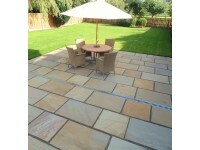 The colour of the paving used can make a huge difference, do you want it to blend in or to make a statement. 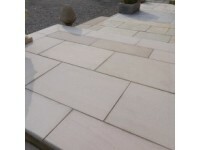 Our Indian paving slabs come in many different colours to match or to contrast, all ethically sourced and quality controlled. The size range of our Indian flags have been designed by Landscapers, the people who lay them all the time, so the sizes do work together. 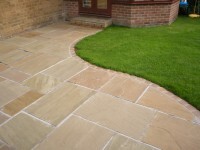 The size range is the same in most varieties of our Indian paving. 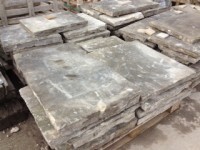 We also show you our Yorkshire sandstone, sawn or riven finished paving as well as our reclaimed Yorkstone slabs. Gravels and chippings can also make a difference . You will be surprised how Natural stone can have so many different textures and colours, from gravels, rounded by water to aggregates, crushed to form chippings in red white and blue, and from the UK too.